All men must die, and Sunday night's Season 5 finale of "Game of Thrones," "Mother's Mercy," ended with the most gut-wrenching death yet (literally). Hearts are broken and tears are flooding the Narrow Sea. In the episode's final moments, Jon Snow was stabbed repeatedly by Olly and the brothers of the Night's Watch. But wait, could "Game of Thrones" actually kill off one of its main characters? These theories and clues may reveal some hope for the Lord Commander. Many juicy spoilers and speculations follow. You have been warned! At the end of "Mother's Mercy," Jon Snow was clearly dead, but then again, this being "Game of Thrones," we're never quite sure someone is gone for good. Jon's death occurs rather similarly in George R.R. Martin's novels, so it came as little surprise to book readers. In Jon's final chapter in A Dance with Dragons, Jon is stabbed by Bowen Marsh (a character not prominently featured on the show) and his brothers as they mutter, "For the watch." Jon is alive We never really know when a character is dead on "GoT," unless of course their head is chopped off or they're given a good ol' golden crown. Perhaps Season 6 or 7 will reveal that Jon survived the stabbing after all, but if so, that would be pretty cruel of the showrunners to tease us with a death scene like Sunday's. Then again, Jon may still have a chance to return in the books, according to George R.R. Martin. "Jon fell to his knees. He found the dagger’s hilt and wrenched it free. In the cold night air the wound was smoking. 'Ghost,' he whispered. Pain washed over him. Stick them with the pointy end. When the third dagger took him between the shoulder blades, he gave a grunt and fell face-first into the snow. He never felt the fourth knife. Only the cold …"
So why didn't he feel the fourth knife? The theory goes that Jon warged into the body of Ghost at this instant, thus unable to feel the pain of the knife and only the cold winter air. More support is that the names of the Stark's direwolves have meaning correlated to the child they bonded with. Ghost is Jon's wolf, so perhaps that name means the wolf will hold Jon's spirit within him. Melisandre also has a prophecy in the books that goes, "Now he was a man, now a wolf, now a man again." It's unknown who this vision is about, but many think it relates to Jon. If this theory is true, we may not see Harington next season, but perhaps only see Jon via Ghost. Jon becomes resurrected This theory could go various ways. Some believe that if Jon's soul is preserved within Ghost, then he could later become resurrected or reborn into his original body. After all, in a fantasy world where Lady Stoneheart exists, anything is possible. Many fans believe Melisandre will resurrect Jon's body, which is strengthened by the fact that she's at the Wall now. Another theory is that in her attempt to resurrect him, she will fail and instead his body will be preserved in the ice cells, which are within the Wall in the books and have not yet been introduced in the show. There are other theories that Jon could in fact become resurrected by either Bran and the Bloodraven, or Lady Stoneheart (if the show ever introduces her). Jon will be reborn from fire One fan on the Forum of Ice and Fire, 6fingerhobb, presumes that as soon as Jon is stabbed, his body will be burned immediately so he does not turn into a Wight -- Jon joining the White Walkers would be a true nightmare, but a potential possibility (more on that below). But this fan believes that if the R + L = J theory of Jon's parentage is true, then Jon will have Targaryen blood, thus allowing him to be reborn from fire, as Daenerys was unharmed from fire during her dragons' birth in the Season 1 finale. In this case, Jon's soul from Ghost could be transferred back into his reborn body. Jon could become a White Walker We know, this sounds insane, but hear us out. Vanity Fair suggested this theory following the introduction of the Night's King in "Hardhome" two weeks ago. It was alluded to in the episode's final moments, as the Night's King stared down Jon intensely, that there's some sort of connection between these two, or that the King sees potential in Jon. In this case, the Night's King could possibly resurrect Jon's body into that of a White Walker -- not a Wight, though, which are the zombie-like bodies the Night's King resurrected in "Hardhome." On one hand, this theory could be possible if the Lord Commander's body is preserved in the ice cells, but there's also the possibility that Jon's body could become a Walker while his soul is within Ghost. Again, this is all mere speculation, since no one but Dan Weiss and David Benioff know what George R.R. Martin has planned for Jon's future or the Night's King. Jon could lead the White Walkers Now, another even more mind-blowing theory from fan Monika Ponjavić connects to the previous prediction that the Bloodraven will resurrect Jon. In short, this very extensive and detailed theory presumes that Jon's rebirth will then awaken either the stone dragon or the ice dragon, or both, and then he uses them to side with the White Walkers to fight Daenerys and her dragons. Is your mind blown yet? Ours too. Check out Ponjavić's full theory on her website. Kit Harington is definitely not returning next season Entertainment Weekly spoke with Harington about the season finale. Harington flat out told them that he will not return for Season 6. "I’ve been told I’m dead," he said. "I’m dead. I’m not coming back next season. So that’s all I can tell you, really." Yep, Dan Weiss and David Benioff told him, "You're gone." Harington had teased his return to "GoT" with The Huffington Post earlier this month, however. When asked when he will return to set to shoot Season 6, the actor responded saying, "If I start filming 'Thrones. I can’t tell you if I do." Yet there still may be hope for his return eventually. According to leaked contract negotiations obtained by The Hollywood Reporter last year, Harington was one of a handful of "GoT" actors who reportedly signed on through Season 6. He was also said to have "completed an extensive renegotiation" for a potential Season 7. Harington did tell EW though that these salary rumors were "inaccurate in many ways." The actor said, "As far as the salary thing goes, that angered me when that story came out. I don’t know where it came from," adding that previously he's never been told about his future on the show. We're still holding out hope though that maybe, just maybe Jon will return via Ghost in Season 7 season (perhaps Harington will merely do voiceover work for the character), or eventually become reborn or resurrected. After all, he's Jon freaking Snow. He may know nothing, but he's too significant to die a simple death, right? 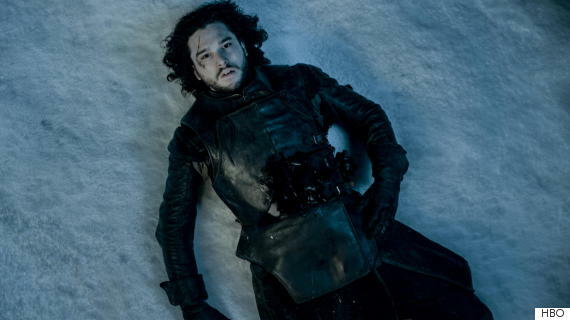 Jon might just be dead This could simply be the end of Jon Snow as we know it. Perhaps Martin has killed him off and we've all be speculating and praying to the old gods and the new for nothing. All men must die, after all. But we really, really hope that's not the case. 'Til next year ... or until more details leak from the set!